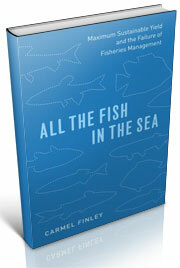 ← A Fishy New Book! Alaskan Salmon Traps! It has been with a great deal of pleasure that we’ve gotten back to our current preoccupation, which is short history of the development of fisheries and fisheries science in Oregon, which we will use in the class we’re teaching fall term in the Honors College at Oregon State. 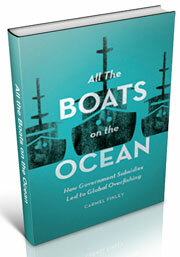 There really is a we involved, I am working with Mary Hunsicker, who is a fisheries oceanographer at the National Center for Ecological Analysis and Synthesis Center in Santa Barbara. . Bob Hitz is tracing the paths of some of the West Coast’s most prominent fishery research ships and he’ll be posting on that soon. We all have different parts of the same story. By combining our pieces together, we have a much richer and much more illuminating sense of what has been happening on in the ocean off our coast. irrelevant the state lines were. 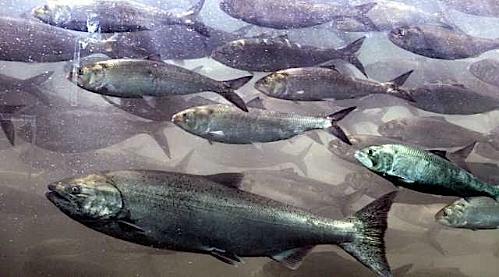 Fishing developed in two places along the West Coast, and it developed around two iconic fish, sardines and salmon. A California sardine both, the Nordby, making a delivery to Coos Bay in 1935. 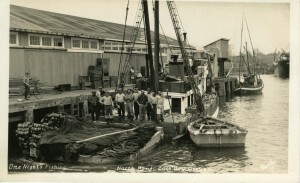 Photo courtesy of of the Coos Historical and Maritime Museum. The two species could not be more different. 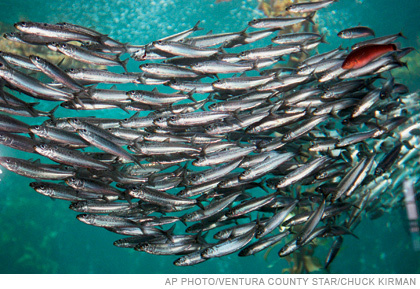 The California sardine is a small, oily fish that inhabits coastal waters, where it provides sustenance for larger fishes, marine mammals, and seabirds. Pacific salmon are a top predator that migrates great distances between rivers and the open ocean, bringing vital marine nutrients from the sea to the freshwater and riparian ecosystems. Yet both could be canned, and both were found in such plentiful abundance that investors flocked to the two industries.Too many boats entered both fisheries. Both took a long time to recover from overfishing. And both have played important roles in shaping the development of American fisheries science–and in Japanese and Soviet fishing sciences as well, but that’s a topic for a later. Fisheries off the West Coast developed on a regional basis, unimpeded by state or national boundaries. American salmon and halibut boats fished off British Columbia and into the waters of Bristol Bay in Alaska, then international waters. American tuna clippers during the 1930s increasingly fished off Mexico, then Peru, Ecuador, and Chile. Fishing boats moved with ease and so did the processing equipment. When fisheries failed in one area, the equipment could be moved to a new site. As Puget Sound salmon stocks faltered after World War One, processing equipment was moved to Alaska. As the California sardine fishery dwindled in the 1950s, the processing equipment was moved to Peru. The development of fishing was the building of a network of fishermen, boats, and scientists. Monterey, California, and Seattle, Washington, were geographically separated, but they were the centers for the development of the West Coast’s two most important fisheries. 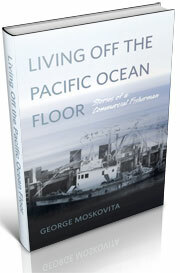 They were not only linked by the fish, but by the fishermen like George Moskovita, who participated in both fisheries. And they are also linked by the science. Just as George navigated the waters between Bristol Bay and Baja, California, so did scientists like Charles Gilbert, William F. Thompson, and Dayton Lee Alverson. The science followed the fisheries; as fishermen landed increasing numbers of fish, new state and federal fisheries agencies struggled to gain understanding of the fish and impose regulations to control the catch and sustain the stocks. One of the characteristics of the development of fishing off Oregon is that it was generally instigated by capital from outside the region, looking to make high returns on investment. California boats and processors played significant roles in the development of Oregon’s trawl and tuna fisheries. Federal money, first as price supports during World War II and the Korean War, helped provide a steady market for the fluctuating supplies of fish. The creation of the National Sea Grant Program after 1966 brought federal dollars into the development of fishery research programs. The initial focus was to make fishing more efficient, with research into gear technology and processing methods for fish that did not have a ready market, such as Pacific hake. Once we have an overview of how fisheries and fisheries science developed, we’re hoping that more people will come forward to add color and texture to this important project in environmental history and history of science. Charles Gilbert and Henry O’Malley, Special Investigations of Salmon Fishery in Central and Western Alaska, Alaska Fisheries and Fur Industries, Document 891, 1919, 143-160. Gregory Cushman, The Lords of Guano: Science and Management of Peru’s Marine Environment, 1800-1973, Ph.D dissertation, University of Texas at Austin, 2003. This entry was posted in California sardines, Carmel Finley, Charles Gilbert, Dayton Lee Alverson, Environmental History, fisheries science, Fishing, George Moskovita, History of Science, History of Technology, Marine Policy, Maritime History, Ocean fishing, Overfishing, Pacific Fishing History Project, R/V John N. Cobb, William F. Thompson, World History and tagged California sardines, environment, fishery research, National Center for Ecological Analysis and Synthesis, Oregon, Oregon State University, science, W. F. Thompson, West Coast of the United States. Bookmark the permalink.